A couple of days ago Lewis Rue and I paddled Herrod’s Creek to the confluence of the Mulberry River at Byrd’s Adventure Center in Arkansas. We parked near West Cobb on Hare Mountain and bushwhacked down a steep rivulet into the Herrod’s basin with our kayaks. Halfway down we encountered the elusive Mulberry limestone layer from some lost ‘Ozoic era. Limestone is hard to find in the Mulberry watershed, which is generally sandstone based. This particular outcrop features a true cave with calcareous features. Who knows how many bats, bears, and other critters have lived here over the ages? Downhill, Lewis discovered a patch of goldenseal growing near the creek. It became apparent that a special blend of plants, animals, and rocks are hiding in this unspoiled basin. 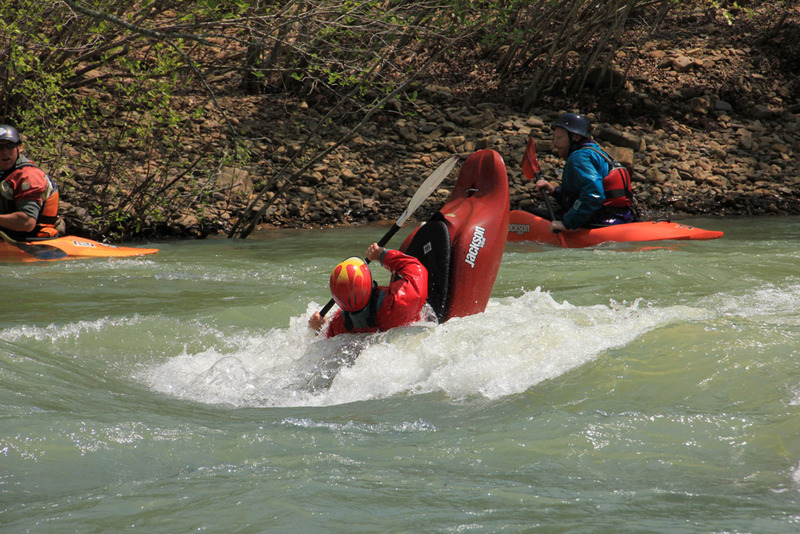 Upon reaching Herrod’s Creek we hopped in our boats and blasted down several miles of nonstop class II and III rapids. There are more limestone ledges in the creek, making fun class III drops. Midway down sits a bus-sized boulder made of a weird limey-sandy conglomerate. It rolled down the hill some time ago and now seems happy in the middle of the creek. We never encountered serious log jams during the trip. Unlike Baron Creek and some other Mulberry tributaries that have been paddled recently, Herrod’s didn’t require any getting out of boats except for occasional scouting. I would recommend this run for new creek boaters or for anyone with a love of wilderness. It’s a short trip you can combine with some of the other creek runs along the Mulberry. I have no idea when Herrod’s was first paddled or “whodunit,” but we kayaked Herrod’s when the Mulberry was running about 8 feet and I’d say it was on the low end of optimal. Incidentally, Herrod’s Creek shows up on the original General Land Office survey plats from 1842. A close inspection of the map (below) shows the primitive “Road from Ozark to Huntsville” ran—and still runs—along Herrod’s Creek. The original Turner’s Ferry across the Mulberry River also shows up on this map, near where the Byrd family settled in the 1850s. A mountaineer-style hike can be made from Herrod’s Creek to the summit of Hare Mountain and back via the Ozark Highlands Trail at Byrd’s Adventure Center. You can visit Spy Rock along the way. At 2,395 feet, Hare Mountain is the highest peak along the Ozark Highlands Trail. The ravines and tree-covered slopes of this mountain feed a number of Mulberry tributaries including Herrod’s Creek, Indian Creek, and Mountain Creek. Herrod’s Creek, at 8ft, wow!